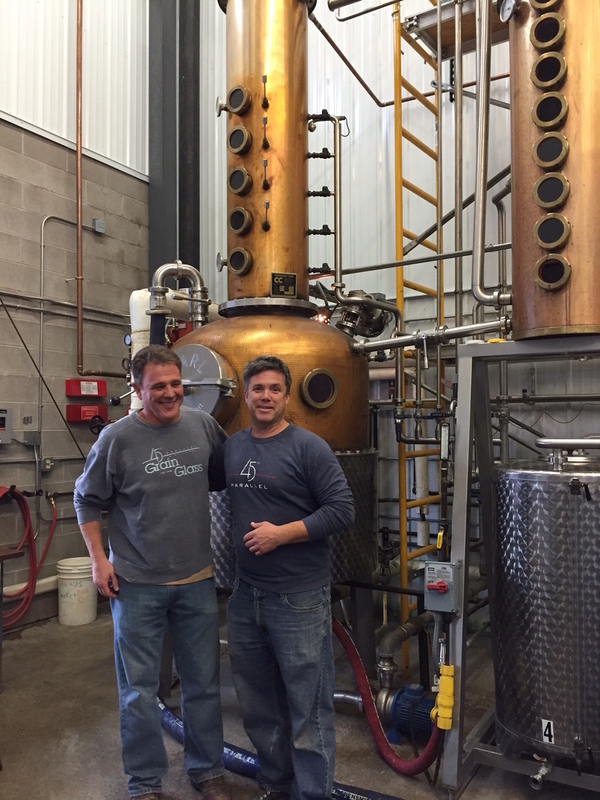 Tyson Schnitker is one of the most thoughtful distillers I’ve met. He’s also one of the warmest. Schnitker, who owns the Skaalvenn Distillery with his wife Mary, makes vodka and rum in a small warehouse space in an office park in the Minneapolis suburb of Brooklyn Park. He’s price-conscious in the best way: “I don’t think anyone should pay a premium for vodka or un-aged rum,” he told three spirits aficionados on a recent tour. Both the vodka and the rum retail for around $20 (750ml). Prices this reasonable are rare in craft spirits – particularly when the product and packaging are this good. Skaalvenn launched about a year ago, and hasn’t slowed down since. The Schnitkers produce as much as they can, with demand strong for both rum and vodka. Asked why they chose Brooklyn Park (Skaalvenn is the suburb’s first distillery), he explained that it was about money and convenience. He and his wife live nearby, and when they did the math for Minneapolis rent and the gas to drive there and back (accounting for frequent trips to the hardware store during set up), it was clear that they’d save thousands by building closer to home. The rum is made from unrefined cane sugar bought from a Louisiana sugar mill (according to Schnitker, the northern-most cane fields in the world). The vodka is made from Minnesota-grown wheat, which was much harder to source. Schnitker wanted to use wheat as opposed to corn (which would have been easier to find in Minnesota) because he prefers the smooth flavor the grain imparts. After a frustrating search, a friend suggested he place an ad on Craigslist. Though incredulous, Schnitker posted a plea for local wheat, and was shocked when he got a swift reply: a farmer in Benson, Minnesota had been growing wheat intended for Shakers Vodka (which went bankrupt in 2012) and was thrilled to find another local spirits producer in need. As Heavy Table announced recently, Skaalvenn will soon release its third product: aquavit. It’s a natural fit for a brand that means “cheers” and “friends” (skaal and venn) in Norwegian. This aquavit will be bottled at 100 proof (50% abv), which is a nod to the cocktail scene – bartenders and cocktail enthusiasts prefer a higher proof spirit to stand up to the dilution of ice. The formula will be traditional, and when we tried it, we agreed with Heavy Table’s comparison to aquavit by Duluth-based Vikre, as opposed to a Gamle Ode. But when we sampled the spirit, the formula wasn’t quite finished. “It’s 85% of the way there,” Schnitker told us during the tour. The goal is a traditional aquavit, but one with bolder flavors than others he’d sampled in the market. He’s using the infusion method, rather than redistilling with the botanicals. You can’t tell from the photo at left because the bottle is empty, but the aquavit has a slight amber hue from the oak infusion. However, Schnitker is adamant about not adding tiny amounts of “B.S. ingredients,” just to to be able to say they’re part of the recipe. The aquavit will be in Minnesota stores early this summer and will probably retail for around $29. It took me one sip to realize that I’m not the target market for this syrupy-sweet soda with a hidden boozy kick. While it sounds folksier than Smirnoff Ice and craftier than Mike’s Hard Lemonade, Not Your Father’s Root Beer is brewed in the same giant facility—despite its claims of being a craft beer. Don’t get me wrong, Not Your Father’s Root Beer tastes great. But it’s a root beer soda that hides its booziness (5.9%) behind a lot of sugar: it’s really sweet (ice is a must) and the alcohol is undetectable. Which is probably part of its popularity. It tastes like soda, but it’s categorized as beer. How’d they do that? 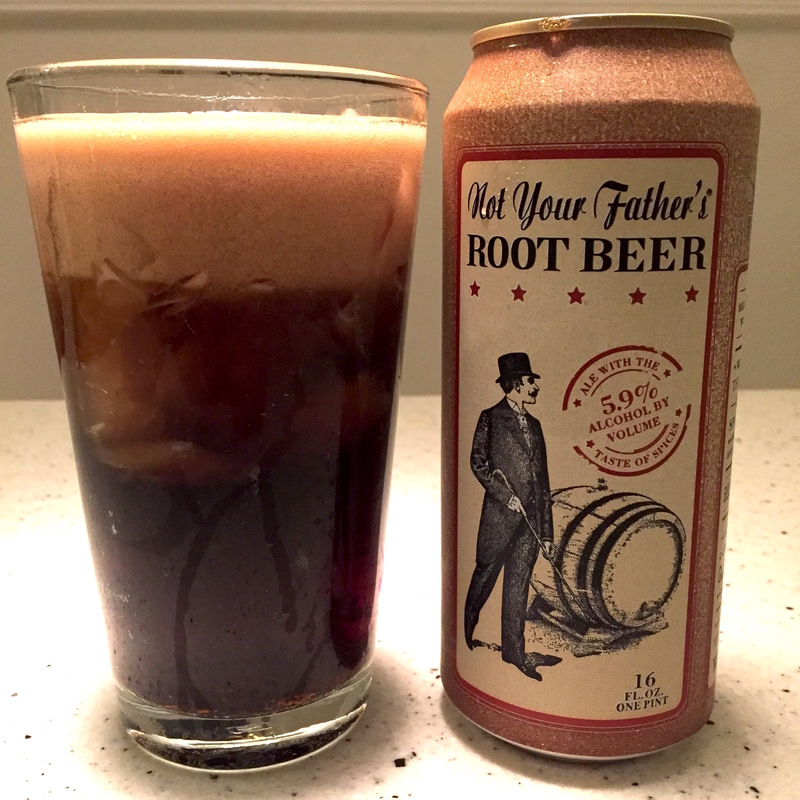 Not Your Father’s Root Beer was created by Small Town Brewery in Wauconda, Ill., about 50 miles outside of Chicago—although if you go to the brand’s website, there’s no longer any trace of this. Owner Tim Kovac, who launched the brewery in 2010, has an elaborate origin story that attempts to trace his current work back to a distant relative who apparently made beer in the 17th century; he has even told interviewers that his mother unearthed a 400-year-old leather-bound family brewing recipe book. I don’t care about this. After Templeton Rye and Mast Brothers Chocolate, it’s safer to assume all marketing around a brand’s origins is a myth. But I do care about how products like Templeton and Not Your Father’s Root Beer are made. With the latter, my initial impression was that the root beer was made in a more or less natural, straightforward process. That it was flavored with real herbs during the brewing. That it used real root beer-making techniques from centuries past. Alas, it does not. Wouldn’t it be easier to make a root beer and then add neutral grain spirits to it? Perhaps, but then you couldn’t market it as a beer, and sidestepping the controversial “alco-pop” market is part of this product’s success. Either way, Small Town made a deal with Pabst last year to produce the root beer in La Crosse, Wisc.–where it also makes Smirnoff Ice, Mike’s Hard Lemonade, and other beverages–and distribute it nationally. Don Russell, the beer writer better known as Joe Sixpack, wasn’t as kind. “Something smells about Not Your Father’s Root Beer, and I’m not talking about the heavy dose of vanilla extract that flavors the suddenly popular brew,” he wrote last July. He points out that the label for Not Your Father’s Root Beer was registered with the TTB by Phusion Projects, better known as the owner of the notorious caffeinated fruity malt liquor, Four Loko. For as detailed a discussion as a craft beer geek could hope for, listen to Strange Brews’ two-part investigative podcast on Not Your Father’s Root Beer. Host Andrew Gill asks whether or not there’s a legal reason Small Town Brewery and Pabst (which now owns a share of the brand) insist that the root beer is a true beer, and not a “flavored malt beverage.” Gill also sends some of the product to a lab for testing. When you take away the inconsistent origin story, the question of authenticity, and ownership, we’re left with a product that’s difficult to classify, but one that ultimately tastes pretty good. So do I want to drink it? Not really. If I don’t know by taste that I’m drinking something alcoholic, I start to wonder why I’m not drinking an alcohol-free version of it. Unless the goal is to get drunk quickly and by surprise, why bother? If I need an alcoholic root beer fix, I’ll do just fine with Root, the 80-proof root beer booze from Philadelphia’s Art in the Age (it makes great cocktails and unlike the traditional root beer schnapps, it’s not a low-abv sweet liqueur — it’s a full-strength liquor flavored with root beer botanicals). Paul Werni, whose 45th Parallel Distillery opened in 2007, is a pioneer of the nascent Minnesota and Wisconsin spirits scene. His was one of the first new distilleries to open in the two states at the beginning of the craft spirits revolution and since then he’s grown from premium vodka to a full line of spirits while teaching distilling, building a contract whiskey side business, and helping launch local brands like Mike McCarron’s Gamle Ode Aquavit and Moscow on the Hill’s Referent Horseradish Vodka. A Wisconsin native living in Northeast Minneapolis, Werni had sold his landscape construction business to stay home with his kids so his wife could focus on her career. Two years later, after a great deal of research, he launched his distillery to make premium vodka. There weren’t many options for small-scale stills when he started, either. The big American manufacturers typically catered to big producers so he turned to Carl, a nearly 150-year-old German manufacturer that specializes in the artisan distilling market. Werni added a second Carl still earlier this year, to be used for stripping (the first run of the mash). When Werni started, opening a distillery in Minnesota was prohibitively expensive—the state’s fees doubled in 2005 to $30,000—so he began searching in Wisconsin, near the Twin Cities metro area. Werni has distilled three styles of aquavit for Gamle Ode—Dill, the traditional Celebration, and the aged and spiced Holiday—and recently released a limited production version of the Holiday aquavit that’s aged in 45th Parallel’s New Richmond Rye barrels. The second Carl still was added last fall. The square steel containers in the foreground are the new fermenters. 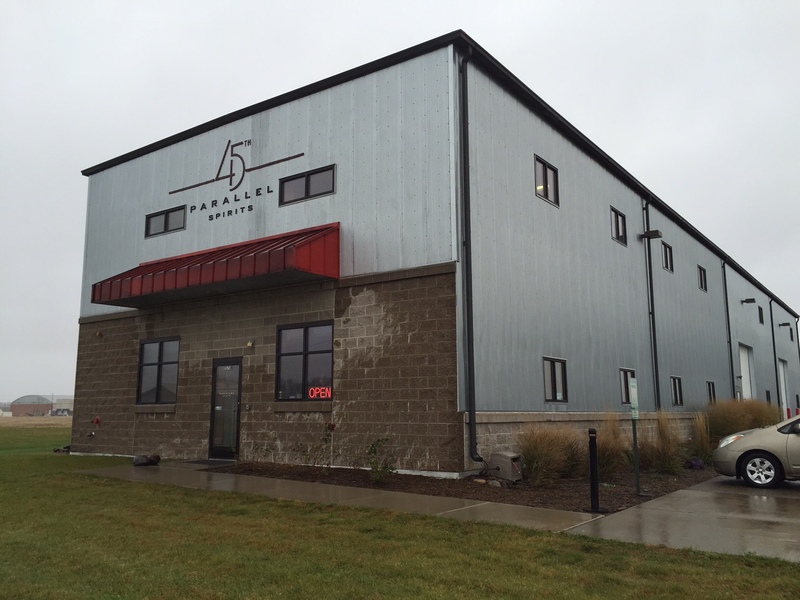 45th Parallel’s square footage has doubled; it’s adding a new bottling line and its own mill. “The farmer currently mills our grain, but we want to handle our own milling and allow for longer onsite storage of grain,” said Werni. Several years ago, Werni was asked if he would make bourbon on contract for another brand. 45th Parallel had a reputation for distilling vodka from corn, so bourbon was a natural next step. He accepted the challenge, and then decided to make bourbon for his own business as well, followed by rye and wheat whiskeys. 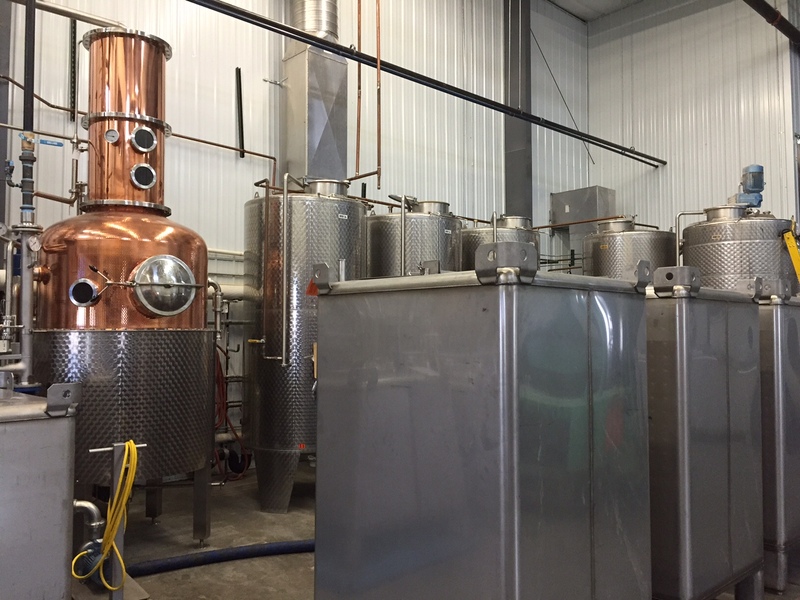 Contract distilling continues to be a significant part of 45th Parallel’s business—“about 25-33% depending on the year,” said Werni. Most of the contract work is bourbon, and most of the distilling 45th will be doing for the next six months will be bourbon, both contract and their own. 45th Parallel’s Border Bourbon was first released in 2012 after aging in barrels for three years. The mashbill is 65% corn (bourbon must be at least 51% corn) and the rest is wheat, rye, and barley. Werni strongly believes in traditional aging methods, which means full-size barrels rather then smaller barrels for shorter durations. “We do not employ accelerated aging to rush the product out,” Werni told me, adding that Wisconsin’s extremes of hot and cold, humid and arid, are good for barrel aging. 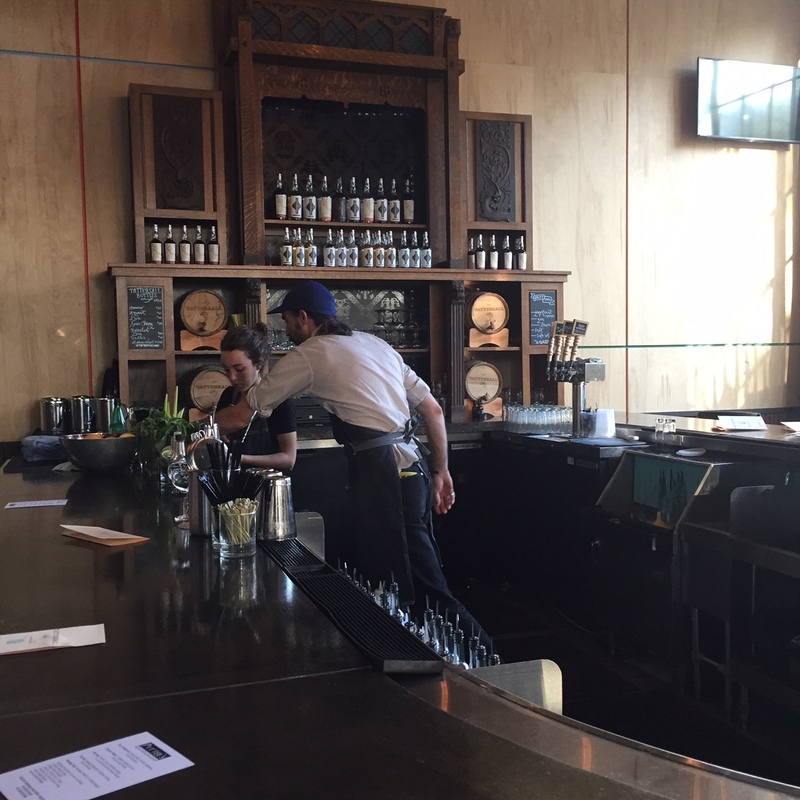 All of 45th Parallel’s whiskeys are single-barrel releases rather than blends of multiple barrels. The current stock of bourbon is between three-and-a-half and four years old, with a new barrel being bottled every three weeks. That’ll shift to a frequency of every two weeks next year, and the goal will be to release whiskey no less than four years old. The New Richmond Rye was first released in early 2013 after about two years in barrels. The mashbill is 65% rye with corn and barley making up the balance. The current rye being released is older than three years; as with the bourbon, the goal is to bottle rye older than four years. What’s next? Werni told me he has plans for a 100% rye, and 45th Parallel made a limited run of a wheat whiskey, aged 4 ½ years and sold only at the distillery. So far, only three barrels have been released. With the rye, he prefers a modified Manhattan. Instead of vermouth, he adds a half ounce of Gamle Ode Holiday Aquavit and a splash or two of grenadine. Some of the greatest cocktails are simply variations on classics, substituting one spirit for another. There are dozens of great riffs on the Negroni (like the whiskey-based Boulevardier), and you can make an Old Fashioned out of just about any spirit — or combination of spirits (like the Oaxacan Old Fashioned with tequila and mezcal, or the Old Bay Ridge with rye and aquavit). But it doesn’t always work. Most of my failed experiments are forgotten, but three stand out because I named them before I even attempted them. I’m so enamored with my cleverness that I can’t give up on them. Not yet. 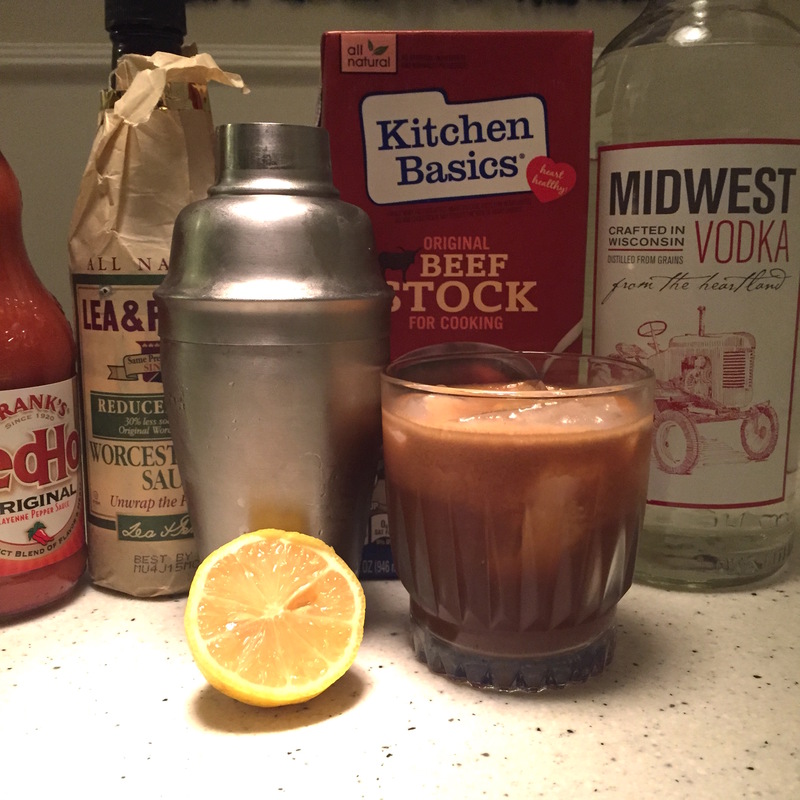 Bullshot, the beef-broth and vodka cocktail, is misunderstood and under-appreciated. Perhaps it’s because it’s basically boozy meat juice; maybe if it were made with bacon or involved bone marrow it could overcome its low reputation. But trust me, done right, it’s fantastic. For a nice history of Bullshot, read David Wondrich’s 2011 story “Bullshot: The Rise and Fall of the Beef-Broth Cocktail” in Edible Manhattan. Shake over ice and strain into a glass of fresh ice. Grate black pepper on top. Anyway, I was making Bullshot one night when I wondered out loud whether or not chicken stock would work too. “Fowl Shot!” my wife shouted. I thought it was brilliant. It manages to reference Bullshot and, randomly, basketball, while innovating in a very logical way. Unfortunately, it’s disgusting. Nothing I’ve tried, no spices, no amount of lemon juice or hot sauce has yet saved the Fowl Shot from being positively vile. I’ve even tried it with aquavit. Like the Fowl Shot, the Lutheran Cocktail is based on clever word play. 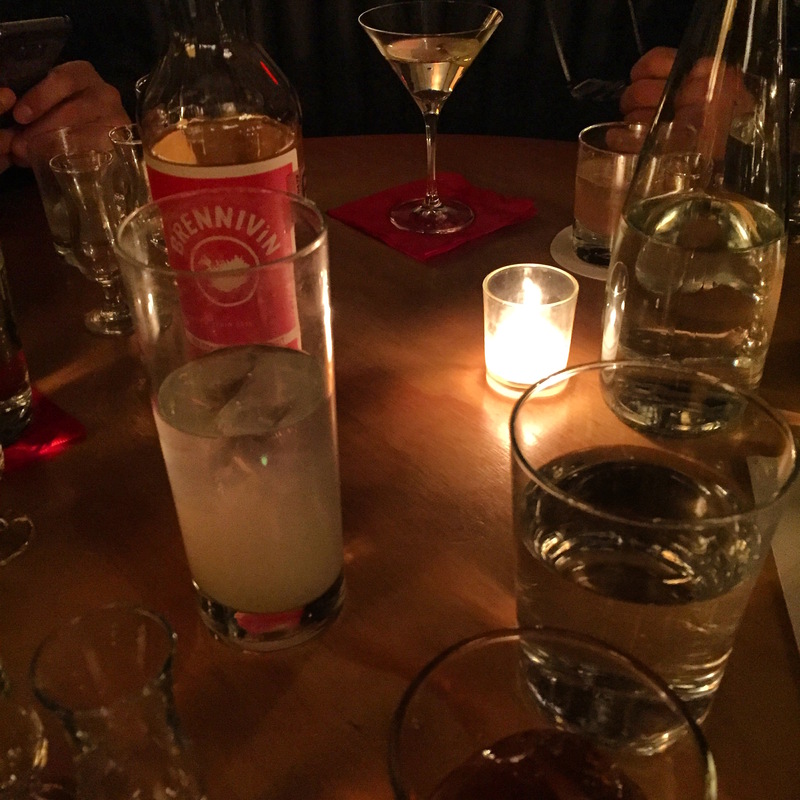 It’s a variation on the Presbyterian Cocktail — basically whiskey and ginger ale — substituting aquavit for the whiskey. Scandinavia, the origin of aquavit, is heavily Lutheran, hence the name. It’s not as awful as the Fowl Shot but it just doesn’t quite work. Not terrible, but when whiskey is so much better, why bother? The original Presbyterian uses scotch, and may get its name (again, we turn to Wondrich for some history) for the fact that it’s the national church of Scotland. I prefer mine with bourbon — a common variation — and with a little lime juice. That technically makes it a Mamie Taylor, but I still call it a Presbyterian because the first one I had at a bar was made with lime. That and Presbyterian sounds better than Mamie Taylor. I start with a good spicy ginger beer, like Reed’s, Fever Tree, or Fentiman’s. 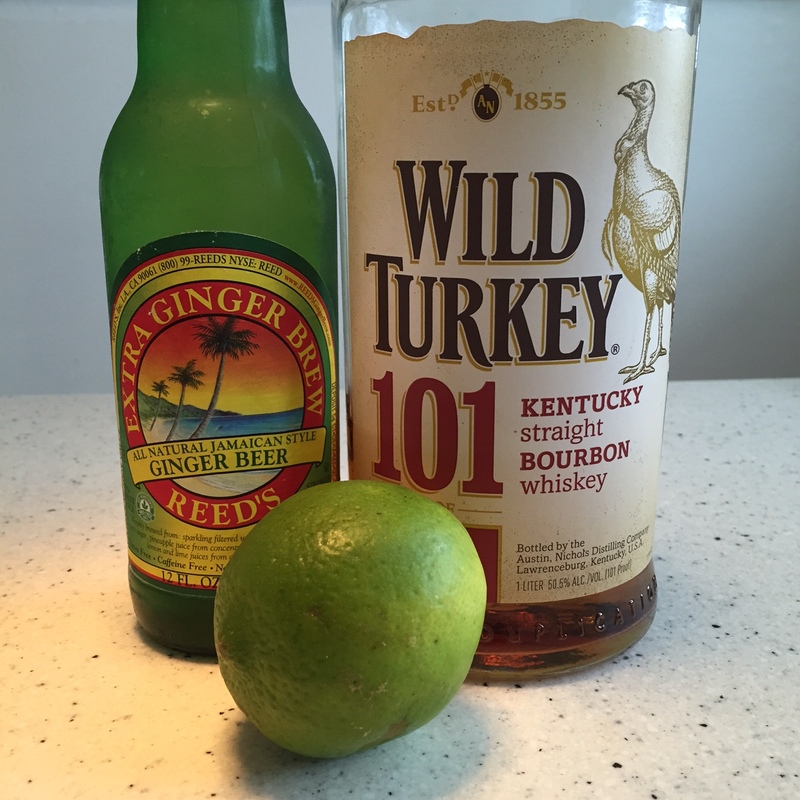 Squeeze half a lime in a highball glass with two ounces of bourbon over ice and add the ginger beer. It’s great. I was determined to find a use for a bottle of pisco — the unaged grape brandy from Peru and Chile — that didn’t involve egg whites. Pisco Sours are fine, but I have an aversion to egg whites in cocktails that I haven’t been able to shake. I remembered that Peru once had an ethnically Japanese president, Alberto Fujimori, and thought, hey — what if I took the venerable Japanese Cocktail and substituted pisco for brandy? There are a number of problems with this, the least of which was that Fujimori, who served as Peru’s president from 1990 to 2000, fled the country in disgrace and was convicted of war crimes. Okay. Not a good name for a pisco-based Japanese Cocktail riff. So now that we’ve got the name sorted out, why did the cocktail fail? Actually, I don’t know that it did. 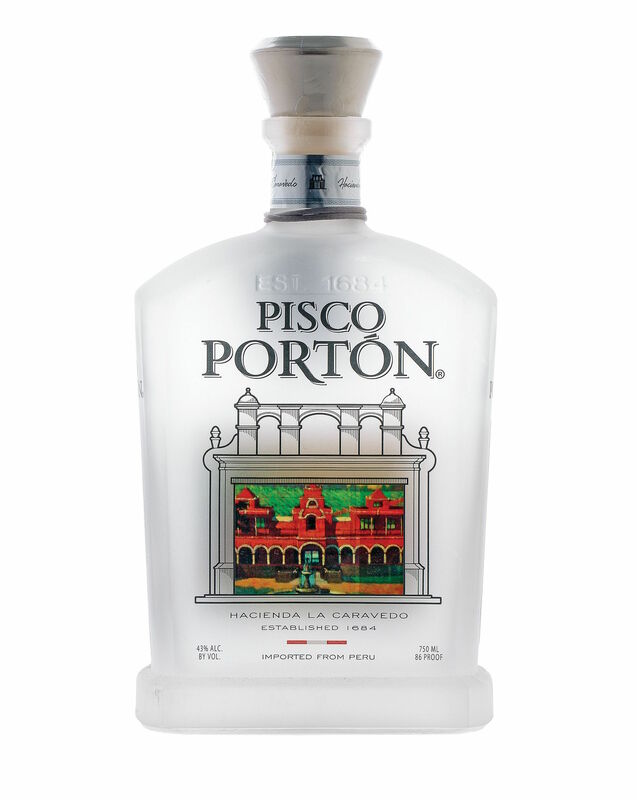 This might be one I need to try again…once I restock my pisco. In the meantime, we have the Japanese Cocktail. It dates back to the mid-19th century, appearing in the world’s first cocktail recipe book, the legendary How to Mix Drinks, or The Bon Vivant’s Companion by Jerry Thomas. It’s really simple and but for the orgeat, a common tiki ingredient that isn’t so common in stores, it would be much more popular. Stir ingredients over ice and strain into a coupe glass. Garnish with lemon twist. A few words about the Japanese Cocktail. Orgeat is a pain to make (here’s a recipe; preheat the oven, break out the blender, find some orange flower water and budget between three and twelve hours for the pulverized almonds to sit in simple syrup). Instead, try finding orgeat syrup in a well-stocked liquor store or online. Small Hand Foods in San Francisco makes a good one, and it’s increasingly available across the country. One final note. In his 2007 book about Jerry Thomas, David Wondrich writes that in 1885, the Minneapolis Tribune called the Japanese Cocktail “[A] liquid attack of spinal meningitis. It is loaded with knock-kneed mental ceramics, and is apt to make a man throw stones at his grandfather.” That might be a better description for my Fowl Shot. I recently had the pleasure of joining Joe Spiegel, the Wyoming-based importer of Iceland’s Brennivin, and Mike McCarron, the owner of the Minnesota/Wisconsin brand Gamle Ode for drinks at Marvel Bar in Minneapolis. Bartender Tyler Kleinow started us off with a round of drinks that showcased all three of Gamle Ode’s aquavits: the Tomas Collins, a Dill aquavit version of a classic Tom Collins; an Aquavit Gimlet with Gamle Ode’s Holiday (the favorite of the table); and the Alkaline Trio, a truly weird but delicious cocktail that mixes Gamle Ode’s Celebration aquavit with sodium bicarbonate (yes, baking soda), Aperol, and Ramazotti amaro. Spiegel, who started importing Brennivin to the U.S. in early 2014, brought a bottle of the Icelandic aquavit brand’s annual Christmas release along with the flagship aquavit for comparison. Like the 2014 Christmas Spirit, this year’s was aged in sherry and bourbon casks. And as Spiegel hinted in February, the 2015 has a higher proportion of Brennivin aged in sherry casks than bourbon barrels (last year’s was equal parts sherry and bourbon). The spirit spent six months in the barrels. The flavor was much lighter and more delicate than last year’s; the sherry notes really dominate. Unfortunately, Brennivin is not yet available in Minnesota, and the Christmas Spirit won’t make it to the U.S. until early next year. However, Astor Wines & Spirits, Drink Up NY, and K&L Wines, among many others, all sell it online. The conversation at the table ranged from the fate of the Swedish and Danish aquavit brands (all have pulled out of the U.S. in the last ten years) and the wildly variable price of Norway’s Linie Aquavit (as little as $19 in Minnesota and as much as $59 in one California store) to the bizarre complexities of the three-tier system and the mysteries of government labelling rules (unlike whiskey and many other spirits, aquavit bottles distributed in the U.S. may not have age statements on the label). But most of all, we talked about this current golden age of aquavit in America: not only do we have an explosion of domestic brands that are pushing the boundaries of the category (at least three in Minnesota alone!) and the importation of Brennevin for the first time ever, we have a wealth of new cocktails that are elevating aquavit beyond its Scandinavian roots as a folksy food pairing or retired person’s tipple. Just a few years ago, Minnesota was behind on the craft distilling boom. 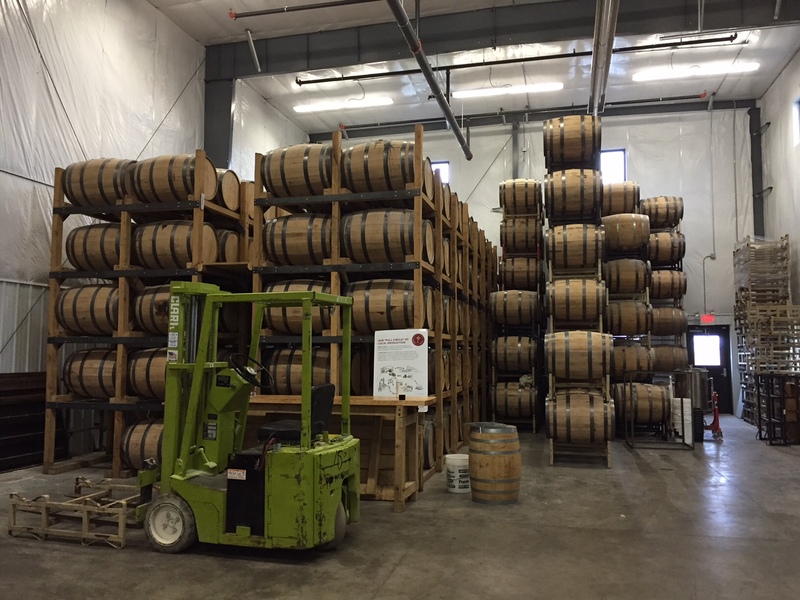 The license fee for new distilleries in Wisconsin was around $1,000. In Iowa it was $350. But in Minnesota, the House of Representatives voted to double it to $30,000 in 2005, just as the craft spirits movement was starting to grow nationally. Minnesota finally lowered the fee to $1,100 in 2011, and in that time, big things have happened. Among the more than a dozen new distilleries are Norseman Distillery and Du Nord Craft Spirits in Minneapolis, Vikre Distillery in Duluth, and Far North Spirits in Hallock, near the Canadian border. And then there’s Tattersall. Its opening earlier this year was exciting on multiple levels: it’s run by bartender and Easy & Oskey Bitters co-founder Dan Oskey, it’s in a beautifully renovated industrial space complete with a large cocktail room, and it’s rolling out a broad roster of spirits that will eventually include some innovative liqueurs and vermouths. 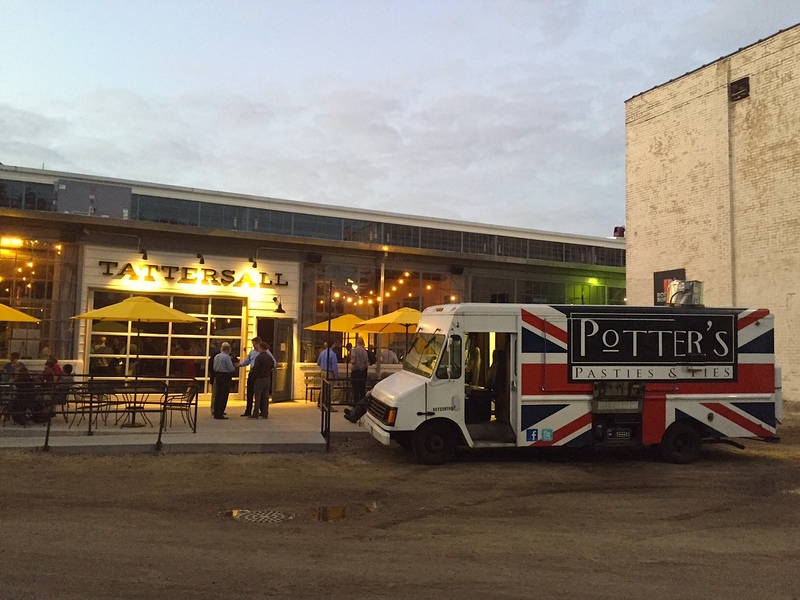 Tattersall, in Northeast Minneapolis tucked behind Central Avenue near the artists’ studios of the Northrup King Building and the Bauhaus and 612 breweries, has quickly become a destination despite the limits and legal restrictions inherent in a Minnesota distillery. Legally, its cocktail room can only serve the spirits it produces. This means it cannot legally serve a proper martini until starts making its own vermouth (it still needs to be licensed as a winery to do so). 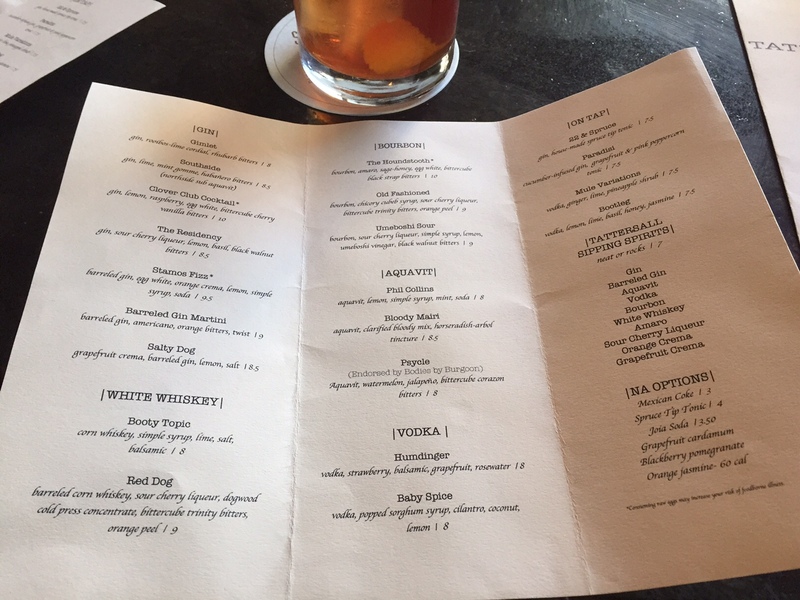 But with two kinds of gin, aquavit, vodka, absinthe, an unaged corn whiskey, a sourced Kentucky bourbon, and an Italian-style amaro, Tattersall has the ability to serve drinks that any craft cocktail bar would envy. Thanks to another change in Minnesota laws, Tattersall and other distilleries are now allowed to sell spirits in small, 375ml bottles (not full-size 750ml bottles) direct to the public. 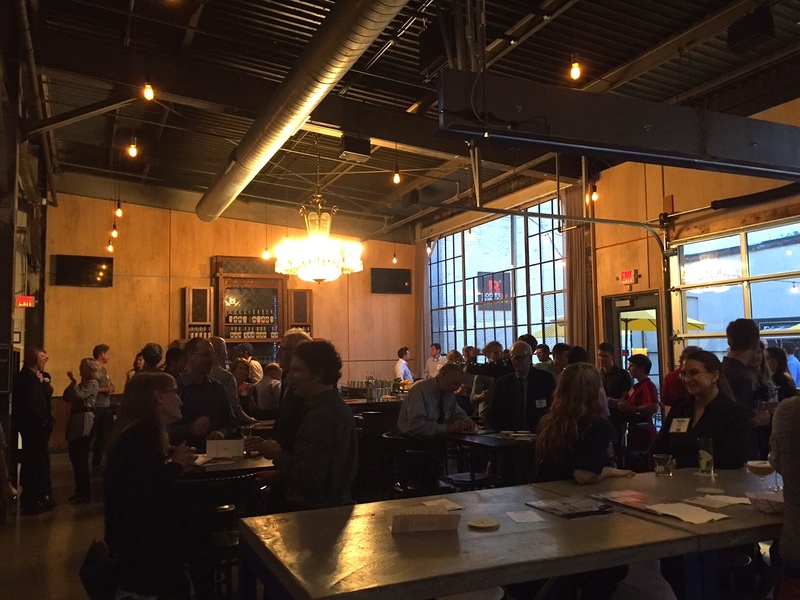 I visited Tattersall for a private event hosted by Architecture MN magazine and attended by a few dozen of its writers, photographers, designers, and readers. Architect Aaron Wittkamper and interior designer Amy Reiff were there to talk about the space they designed for the distillery and cocktail room. Tattersall sits in a back part of the sprawling Thorp Building, a large complex of old factory warehouses on Central Avenue. Thorp was originally a manufacturer of fireproof industrial doors. During WWII, the building was home to a division of General Mills that made the Norden Bomb Sight, a gadget that enabled planes to drop bombs more accurately, and an early flight data recorder invented by a University of Minnesota mechanical engineering professor named James J. “Crash” Ryan. It now houses dozens of businesses, from photographer’s studios and gyms to bike companies and furniture makers. 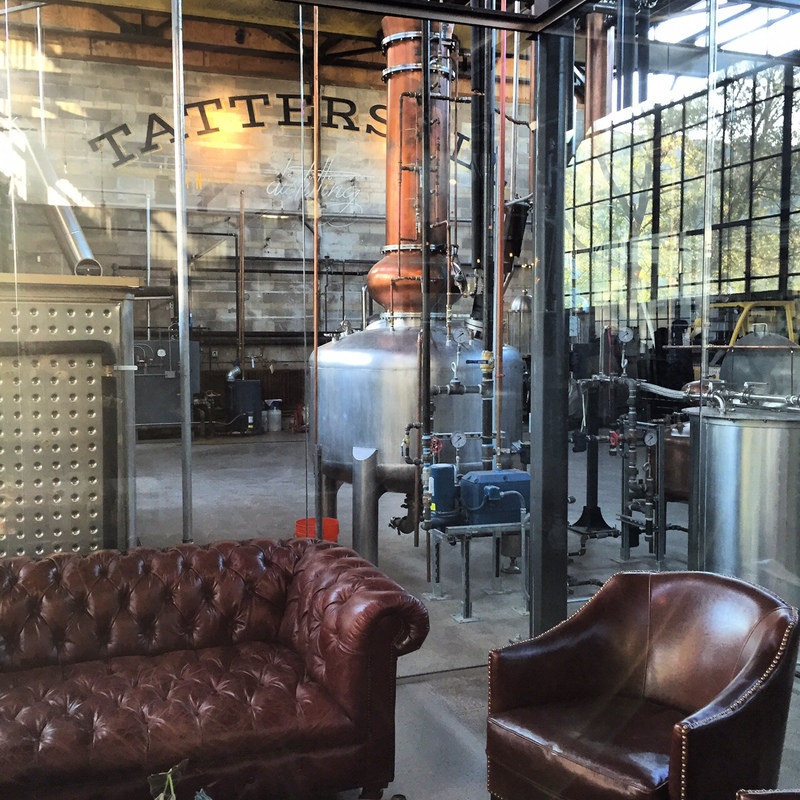 Inside Tattersall, the distillery and the cocktail room are separated by a glass wall. 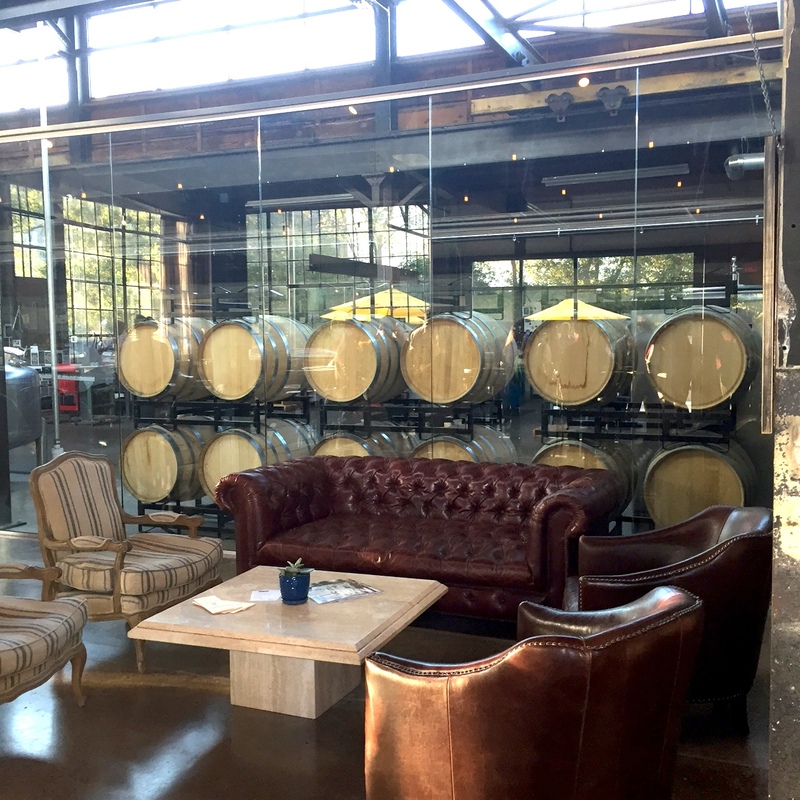 All of the stills, vats, and barrels are visible from the seating area and the bar. The cocktail room isn’t a mere tasting room; it’s big. There’s a horseshoe-shaped bar at one end and huge couches and club chairs at the other. On the other side of the front door from the bar is a section of tall tables and a small stage. Distillery cocktail rooms are a new kind of space — distinct from microbreweries — and Tattersall’s designers opted for a mix of industrial and elegant to reflect that. Reiff, the interior designer, used the distillery’s name, Tattersall (a simple grid-style plaid pattern) as a design cue without being too obvious or becoming too masculine. That manifested itself in things like menswear-upholstered club chairs, a big chandelier, and a salvaged mantle behind the bar. When I interviewed Joe Spiegel, the U.S. importer of Iceland’s Brennivin aquavit last May, he mentioned that the distillery made a limited edition Christmas aquavit each year, and that he was hoping to bring it into our market. I was thrilled. Seasonal beers are common, but too few American distilleries make seasonal spirits. Unfortunately, Brennivin only produced enough Christmas Spirit for the Icelandic market (or maybe not quite enough): 1,000 700ml bottles. A few bottles found their way into the States though. Spiegel and I met at Skál, the Icelandic restaurant in New York’s Lower East Side, and sampled a bottle with some of the staff. Brennivin Christmas Spirit takes the traditional aquavit and ages it two ways: in used bourbon barrels and used sherry barrels (both American white oak). It’s a fifty/fifty blend of the two, each aged six months. The 2012 Christmas Spirit he mentioned was finished in apple cider barrels. 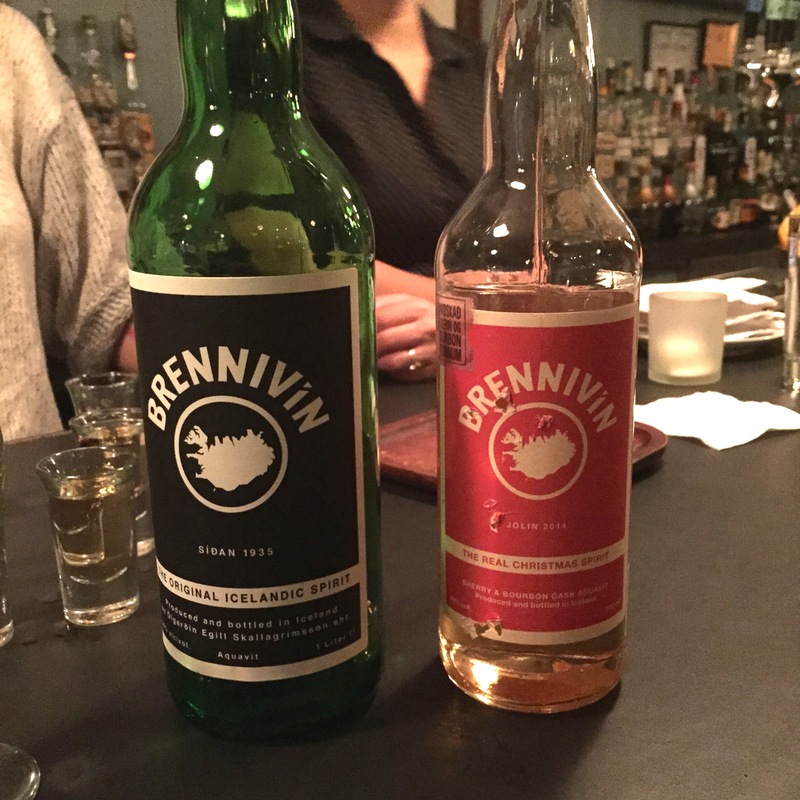 2014’s bourbon and sherry barrels was a first for Brennivin. So what does it taste like? As I learned in my oak-infusion experiment last year, Brennivin takes oak very well. This Christmas Spirit has the slightly increased sweetness and extra viscosity of the Brennivin I infused with oak, but with much, much more going on: hints of both the bourbon and the sherry are in there, blending really seamlessly with the spice of the caraway. It’s delicious. Spiegel says the distillery is bringing back two aged aquavits that haven’t been sold since the 1990s in honor of Brennivin’s 80th anniversary: Odals Brennivin, aged three months (that’s the old label at left), and Gamalt Brennivin, aged one year. One of them will probably make it to our market. 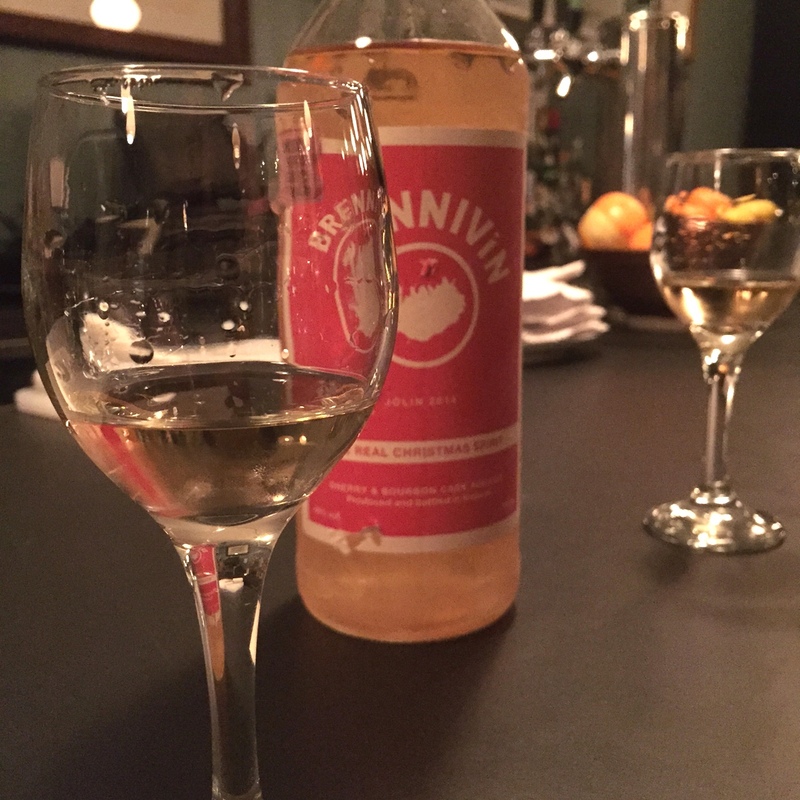 Brennivin’s U.S. distribution started in Wyoming in early 2014, and then New York. Spiegel has since added Los Angeles and some of San Francisco (through K&L Wines and others), Washington D.C., Massachusetts, Oregon, Washington, Pennsylvania (special order), Montana, and parts of Canada (also special order). 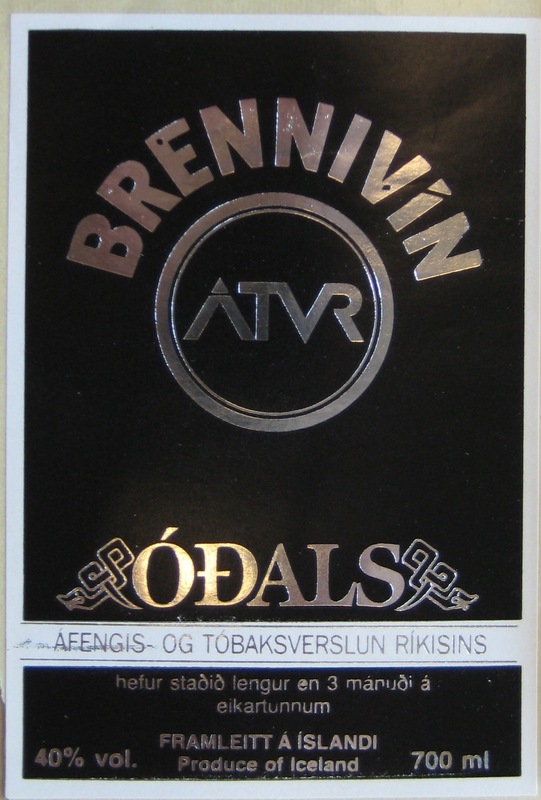 Information on Brennivin’s distribution schedule is updated frequently at icelandnaturally.com. Cocktails & Cologne does not approve or endorse any ads you might see on this blog.